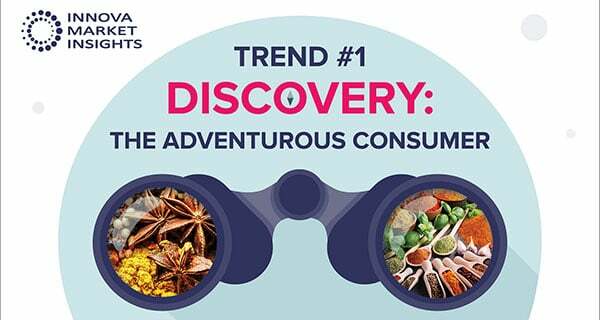 Targeting increasingly adventurous consumers, set on new discoveries and experiences, will be key to developments in the food and beverage industry in 2019, asserts Innova in its latest report on trends for 2019. 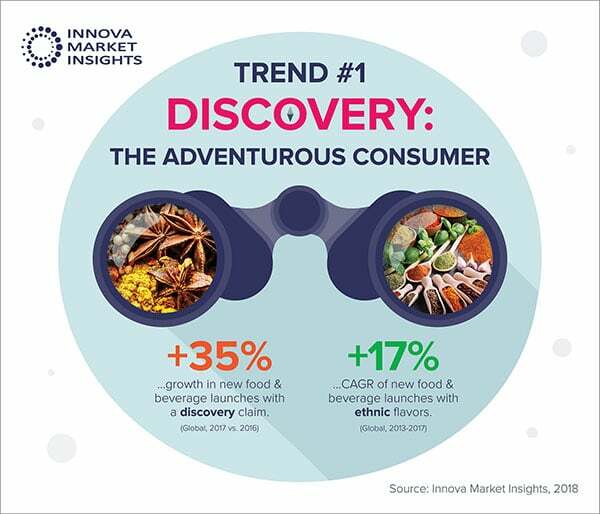 “Discovery: The Adventurous Consumer” leads the list of Innova Market Insights’ Top Ten Trends for 2019. The company continuously analyses global developments in food and beverage launch activity and consumer research to highlight the trends most likely to impact the industry over the coming year and beyond. The food and beverage industry is increasingly focusing on satisfying the adventurous consumer. Consumers are moving out of their comfort zones to explore bolder flavours and multi-sensory food experiences. There is a focus on heightened sensory delivery, often combined with an element of the unexpected. The plant-based market shows no signs of slowing down. Companies and brands are greening up their portfolios to attract mainstream consumers who want to add more plant-based options into their diets. For many, going plant-based is about achieving a healthy and sustainable balance between meat and vegetables, rather than adopting an all-or-nothing way of eating. As more consumers pay attention to health and sustainability, replacement foods and ingredients are on the rise. Health remains the number one reason to buy food alternatives, with one in two US consumers reporting that health is a reason for buying alternatives to bread, meat or dairy. The search for alternative proteins has resulted in a rising use of black beans, lentils, peas, rice, nuts and seeds, chickpea, and even insects, as protein ingredients for foods. The industry is increasingly committing to answering customer expectations around sustainability. This is driving corporate goals, as manufacturers commit to sustainable product and packaging development with a range of initiatives. This includes waste reduction through upcycled ingredients and post-consumer recycling, as well as improved biodegradability and new technology, such as compostable capsules and vegetable inks. For most consumers, snacking is a part of daily life and always has been. What is changing, however, is the way people think about snacking and what is considered a snack. Snacking is no longer the optional extra, but the definitive occasion. It is a central focus of innovation across all food and beverage categories, with 10 percent average annual growth of global food and beverage launches with a snacking claim over the past five years (CAGR 2013-2017).